Each and every standart room consists of the main room and private bathroom (with bathtub or shower and WC). 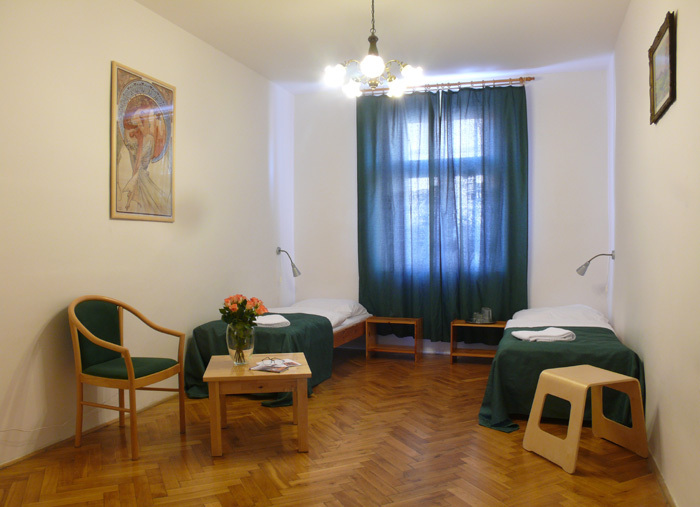 All comfort rooms consist of two rooms and a private bathroom (with bathtub or shower and WC). Some of the rooms are equipped with satelite TV offering a wide variety of channels in many languages. Access to Wi-Fi from every room is a matter-of-course. A variety of other facilities could be provided by the reception free of charge for the whole stay of a guest - a hairdryer, a kettle, an iron with ironing board, various kind of tableware etc. The buffet breakfasts are served between 8 AM to 10 AM in a cosy, non-smoking atmosphere. There is no problem to have a breakfast outside these hours in a form of a take-away lunchbox. The guests can choose between 2 kinds of ham (pork/chicken), salami, 2 kinds of cheese, hard-boiled eggs, pate, cornflakes, milk, youghurt, jam, honey, butter, bread, toasted bread, seasonal fruits and vegetables, tea and coffee or 2 kinds of juices. The guests are welcomed to come just for a cup of coffee or tea alone. There is no problem with arranging also a half board/full board upon request. Each of 50 rooms has private bathroom and free Wi-Fi connection. 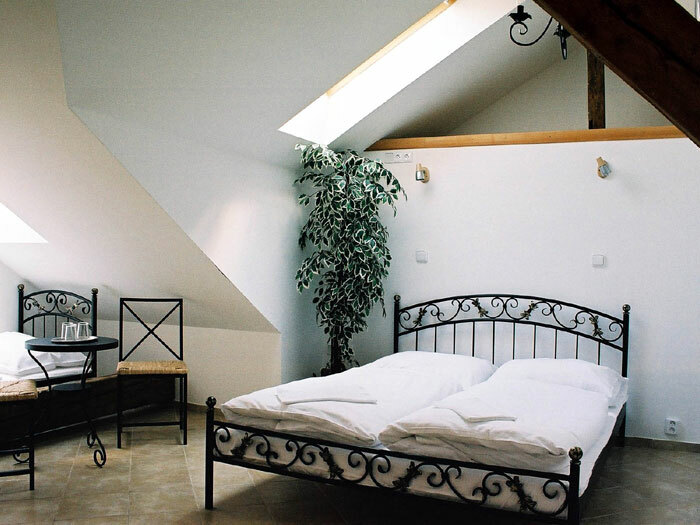 Some of the rooms including 4 attic roooms are equipped with air-conditioning. We offer high quality accommodation service. 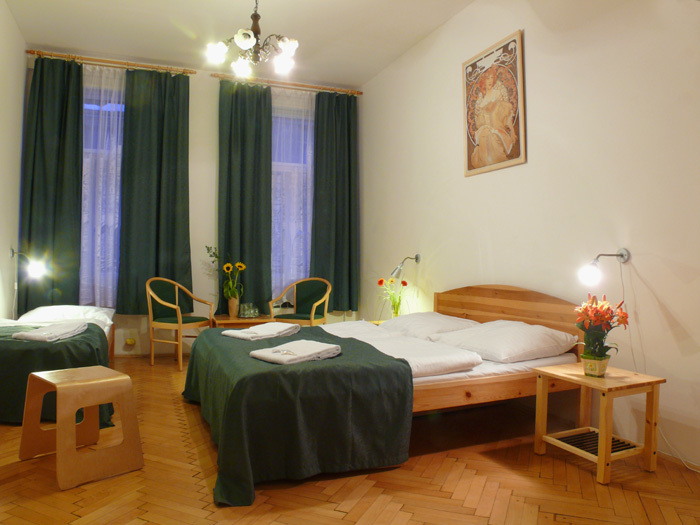 Rooms are bright and clean, beds made up with fine linen. 12 of the rooms are comfort type. 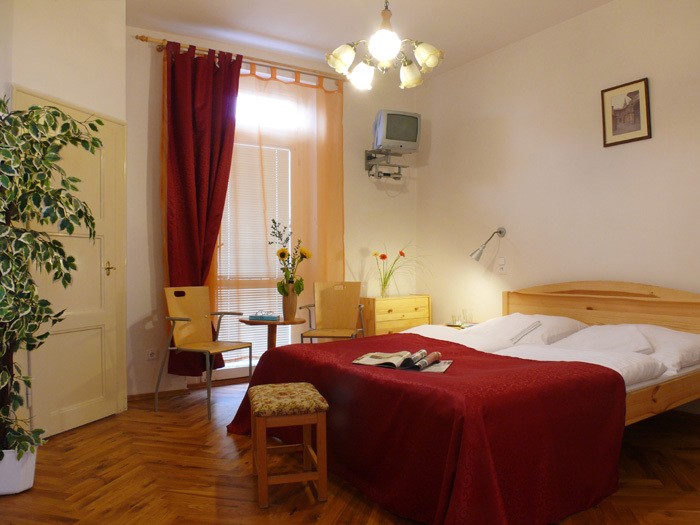 Rooms are larger - APT type, consist of two rooms: In the first room there is a comfortable sofa that can sleep up to two persons, and the entrance to the bathroom with shower/bathtub. In the second room there is usually a double bed and one or two single beds with possibility to add one or two extra beds. You might be used to know hotels as places where you can have a breakfast and leave for whatever it is you came to see; after coming back, however, a little snack or full meal might be often more than desirable and looking for a supermarket in a strange city is always a strain. With us, you can enjoy fresh warm dinner including a soup and salad. For bigger number of individuals we can arrange a nice banquet (even for vegetarians) in a cosy, non-smoking atmosphere. An ideal for travellers who are not fond on noisy and overprized eating places after exhaustive day full of exploring.